Though we still have a few bigger projects to tackle around the house, I think the last frontier of this renovation for us is really organization. We're not pack rats, but it would be nice to, you know, have places to put things. Places like a shed. Like more than one drawer in our kitchen. Like shelves in our closets. This house has eight closets; only two have any sort of worthwhile shelving or organizational value so far. 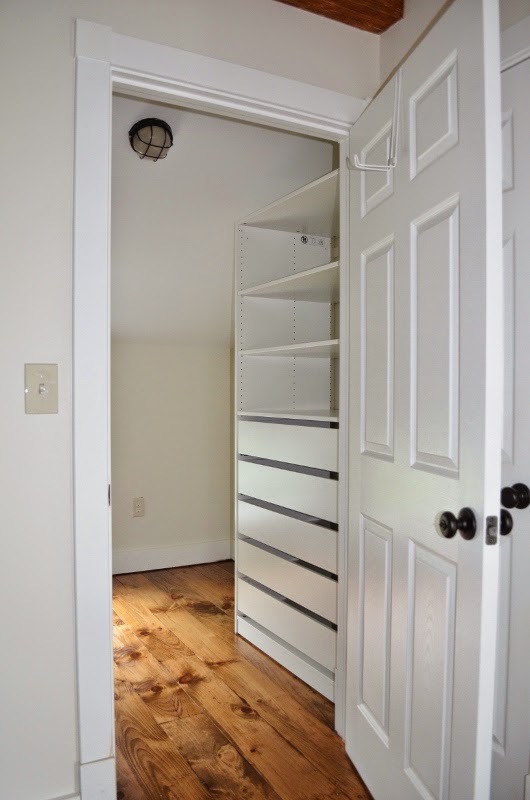 The rest are closets only in theory, lacking everything a closet needs except the door, while real life clutter threatens to overtake our lives at any moment. It is embarrassing and completely ridiculous, not to mention messy and inconvenient. 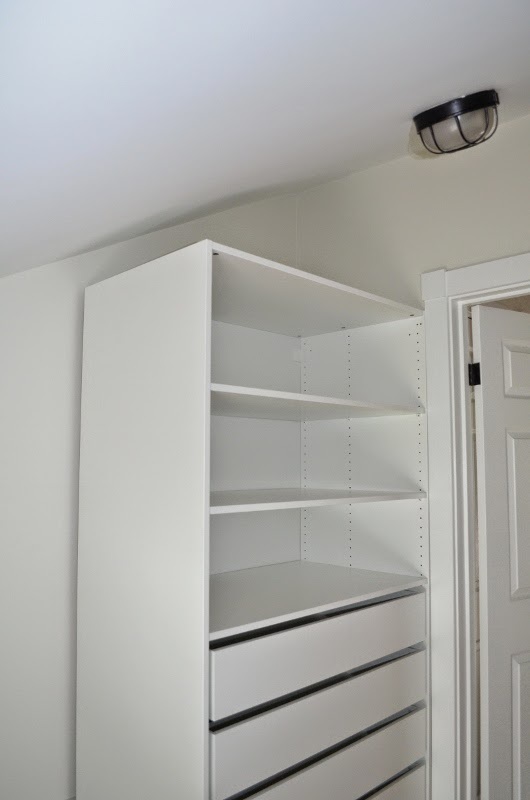 It took a surprising amount of researching and measuring, but I managed to find a customizable closet system that worked with the sloped ceiling in our master closet. I looked at everything -- Container Store, Rubbermaid, Martha Stewart, etc. -- but for the price and comparable level of quality, it was hard to beat the PAX from IKEA. 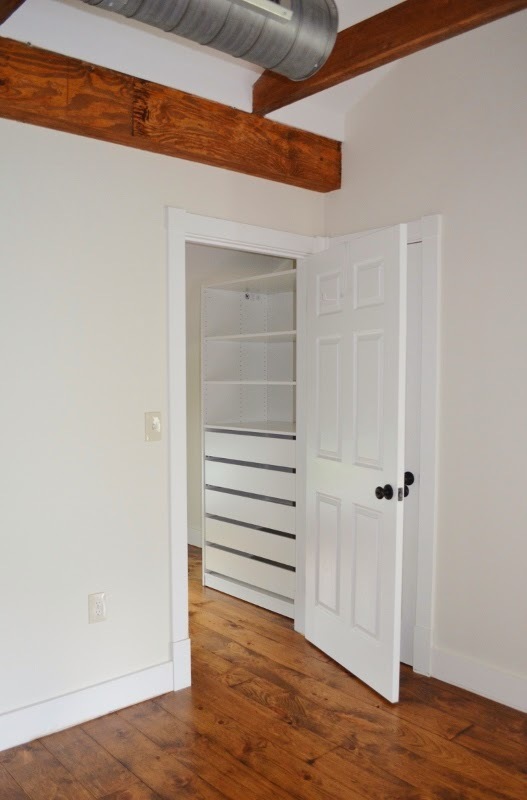 It eluded me for awhile and I didn't think it was going to work, but once I realized it didn't need doors and we could remove a stretch of baseboard to make it fit better, the standard PAX was actually perfect. It fits so well it almost looks like it was made for the space. I guess buying a thing from IKEA and shoving it into a corner is not necessarily blogworthy, but I've been imagining a closet in this space since 2008, so let me have my moment... All this storage space feels so luxurious -- and luxury is still not something we're very accustomed to in this house. Directly to the left of the PAX is a space a little more than three feet wide, where we'll put a small vanity for makeup and jewelry. On the opposite wall, Ez is going to build a long rail for our hangup clothes. We were going to put a separate armoire for him out in the office, but we don't think we'll need it. (It's always an option if we somehow amass larger wardrobes.) Instead, we'll share the hang-up rail and he'll just have a separate dresser in the bedroom or office. I haven't moved my clothes into the PAX from the guest bedroom yet, because we still have to remove the baseboard behind it and secure it to the wall. Details, details.